Will it launch with BlackBerry 10.2? Today is a day for comparison leaks it seems. a Motorola phone, we know have a look at how the BlackBerry Z30 stacks up to its predecessors. This BlackBerry phone, also referred to as the A10, is far from a done deal, though an abundance of leaks and information about the device indicates it won't be that way for much longer. In the snaps,which were sent to CrackBerry, we get a look at the Z30/A10 next to the BlackBerry Z10 and Q5. It's the big kahuna in the group, to say the least. Spec info for the Z30 has been fairly consistent, with reports indicating it will lug a 5-inch screen, 2GB of RAM and a 1.7GHz dual-core processor. We've also heard it will house 16GB of internal storage, an 8MP rear camera, 2MP on the back and a 2800mAh battery. 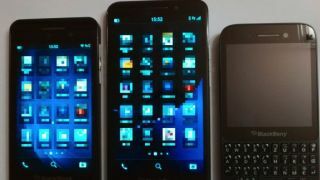 There are signs it may run BlackBerry 10.2, an updated version of BB10, and you may notice that today's pics show five rows of icons, not four. Have you had enough tastes of this new BlackBerry? We're nearing our limit too, so can only hope Waterloo lets this fruit blossom soon. Think this is Robert Downey Jr. in his first spot for HTC?